This page will give you a general overview on the facts about skiing/snowboarding in Shiga Kogen. The ski season in Shiga Kogen starts at some of the higher elevated ski slopes like Kumanoya from mid to late November. The official opening of all ski areas is at the beginning of December and is celebrated by a festival. The last day of ski season is the last day of Golden Week, the Japanese national holiday in the beginning of May. See here for a more detailed explanation. The daytime opening hours of the ski resorts in Shiga Kogen are from 8:30 to 16:30. The operating times are subject to change depending on the weather and location of the ski piste. The free shuttle bus that drives past all the ski resorts in the Shiga Kogen highlands starts operating from early December until the last day of Golden Week, in early May. 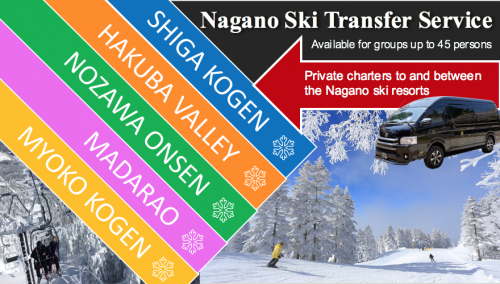 See this blog for more details on the bus schedule to/from Shiga Kogen, and within Shiga Kogen. You can access all separate 19 ski areas with one common ski pass. All ski resorts besides Shibutoge and Kidoike can handle credit card transactions. If you’re going skiing or snowboarding for just a day or a little longer, the below pricelist is what you can expect*. *Prices are subject to change, so please consider the table as an indication. Are you going to be sliding down the slopes for quite a few days? In that case, the Super Pass is the cheapest solution. *Prices are subject to change, so please consider the table an indication. If you think you’re not going to ride that many lifts and gondolas, getting a point card to access the 52 ski lifts and gondolas is your best option money-wise. When purchasing a point card, you can choose between 20 and 50 points. If you run out of points, you can easily purchase more with one point being the price of 100 JPY. Every lift and gondola has a different charge depending on the length of the ride. A lift is between 2 to 6 points, and a gondola is between 6 to 9 points. You can, unfortunately, not take the points you have remaining to the next season. They are only valid for the season you’ve purchased the ticket in. Remaining points cannot be reimbursed. Off-piste skiing can be done in the mountains of Okushiga Kogen, one of the highest point of the Shiga Kogen highlands. See this activity for more information. One of the nice feats of Japan’s ski resorts is skiing in the night, called nighters. Nighters are less expensive than their daytime counterpart, ranging from 1,600 JPY to 2,000 JPY for adults. Children are free at some places and up to 1,000 JPY at some. Some of the higher ski pistes in Shiga Kogen open up at 18:00 and some later. Closing times are between 20:00 and 21:00. There’s a lot of variety depending on the area (opening times can also be influenced by weather circumstances). Beware though, you cannot use your Point Card 0r Ski Card for nighters, you’d have to buy a separate pass. There are multiple locations within Shiga Kogen where you can rent winter gear, most of them affiliated to hotels in the area. Snowcan is one of the independent stores in Shiga Kogen where you can rent ski/snowboard gear and winter wear. See for more information on location and stores here.